In May of 2016, REX Exchange Traded Funds introduced two volatility oriented products, VMIN and VMAX. One is a bet on market volatility staying the same or dropping (VMIN) and VMAX is essentially its mirror image—betting on short term volatility increases. VMIN has some important structural and performance related differences that distinguish it from the other short term inverse volatility funds—VelocityShares’ XIV and ProShares’ SVXY. In this post I focus on VMIN’s differences from its competitors. If you are new to inverse volatility investing I suggest you review the fundamentals by reading How does SVXY Work? 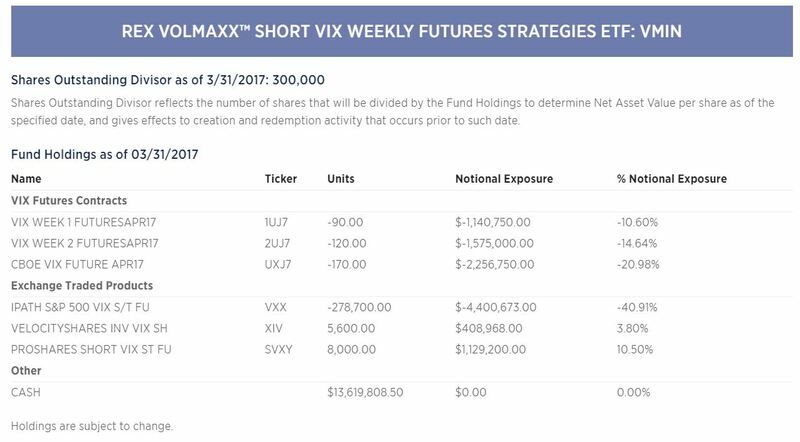 For a good understanding of VMIN (full name: REX VolMAXX™ Short VIX Weekly Futures Strategy ETF) you need to know how it differs from other inverse volatility funds, what it tracks, its risks to the investor, and how well it has performed. How Is VMIN Different From a Performance / Tax Standpoint? Far from being a “me-too” product, VMIN differs from its SVXY and ZIV competitors in a number of important ways. One key difference is that VMIN is designed to track the daily moves of the CBOE’s VIX® better than existing securities. VMIN is an inverse fund, so it generally moves in the opposite direction of the VIX. In addition to this improved tracking, VMIN also outperforms its competitors in taking advantage of the structural drag of VIX futures when their term structure is in contango. Contango exists when longer-dated VIX futures are priced higher than VIX futures that have less time until expiration. The VIX futures that underlie the volatility Exchange Traded Products (ETPs) are in contango around 75% of the time. In the May 2016 to March 2017 time period, VMIN outperformed its completion by 28% due to this characteristic, more than tripling during that period. In fact, VMIN was the best performing fund in the ETP universe in the first quarter of 2017, outperforming all other 23,788 funds, with a 35% gain. While VMIN is an Exchange Traded Fund (ETF) like SVXY, its tax reporting is the same as an ordinary equity investment with your short and long-term capital gains reported via 1099 forms. Because SVXY holds VIX futures directly tax laws require that it be treated as a partnership, reporting gains/losses via Schedule K-1 forms. While not a huge deal; K-1 forms are complicated and always seem to arrive very late in the spring. VMIN will make distributions of any realized securities gains at least once a year. In a good year this special dividend will likely be substantial (for FY 2016 it was $9.92/share). Neither XIV nor SVXY distributes capital gains this way—they have different legal structures (Exchange Traded Note and an ETF structured under the Securities act of 1933 respectively). Special dividends from VMIN or VMAX will be taxed as ordinary income. How Is VMIN Different From a Structural Standpoint? For regulatory and performance reasons VMIN and VMAX are registered as actively managed funds. This was a first in the volatility ETP space; the rest of the volatility ETPs are passive funds that track a predefined index. These predefined indexes are inflexible in their investment strategies in that the index methodology specifies what securities to utilize and in what proportion. Being an active fund is key to VMIN meeting its performance It needs to utilize the CBOE’s relatively new Weekly VIX futures —a set of VIX futures expiring every week (more on this later). While they are improving, the weekly futures do not always have acceptable prices/liquidity so management discretion on trading strategies is required to make cost-effective investments. Active (rather than passive) management was also required for VMIN to avoid partnership style tax treatment. As a Registered Investment Company (RIC) adhering to the requirements of the Investment Company Act of 1940 VMIN can hold up to 25% of its assets in a private entity. In VMAX’s case, this entity is a wholly-owned subsidiary incorporated in the Cayman Islands. By utilizing the subsidiary to hold the VIX futures VMIN can benefit from the short VIX futures positions without holding them directly. The remainder of VMIN’s assets are invested in other volatility ETPs or cash. According to IRS rules for RICs no more than 25% of the fund’s total assets can be invested in the securities of any one issuer, so VMIN spreads out the rest of its holdings, typically by being short Barclays’ VXX, long Proshares’ SVXY, and long VelocityShares’ XIV. You can view VMIN’s holdings every day on their website. The image below shows a typical report on holdings. 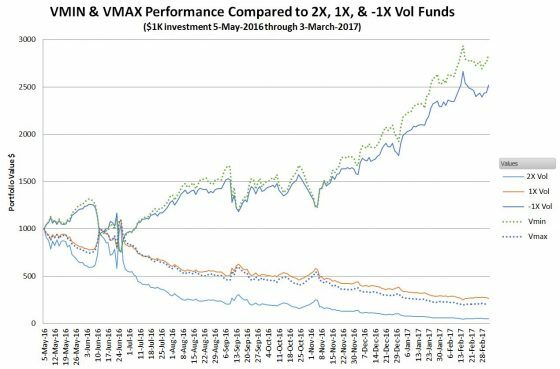 VMIN and VMAX are unique amongst VIX futures based volatility ETPs in that they don’t track an analytical index—instead, it’s up to the fund manager to trade the fund’s holdings to achieve the desired performance. 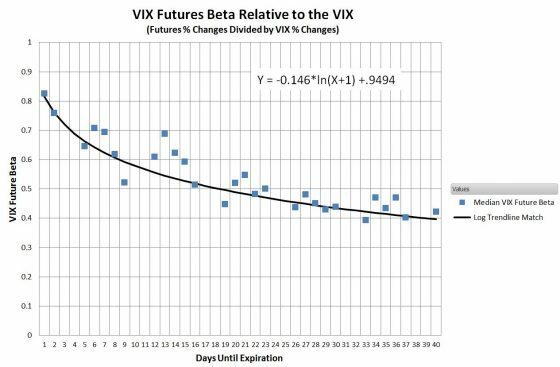 VMIN’s goal stated in the prospectus is: “the weighted average of time to expiry of the VIX Futures Contracts to be less than one month at all times.” The following chart illustrates the implications of that goal. 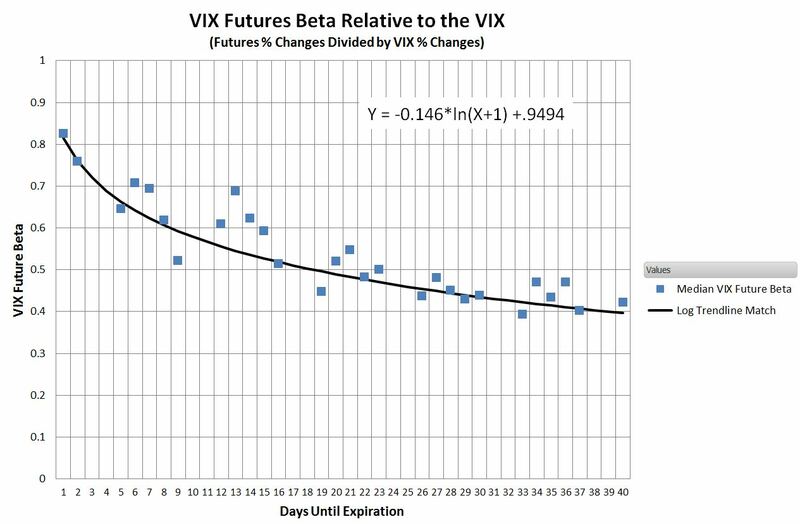 This chart shows the statistical relationship of the ratio (called beta) between the percentage moves in VIX futures divided by the percentage moves of the VIX. This relationship tightens as the future approaches expiration. For example with one day until expiration, the median percentage move of a VIX future is a factor of about 0.85 compared to the VIX’s move. In comparison, a VIX future with 40 days until expiration will only move about 40% of the VIX’s daily moves. On any given day this multiplier might vary quite a lot (the standard deviation runs around 9), but over time the values center over these values. All the short term volatility ETPs except VMIN and VMAX track indexes that algorithmically roll contracts daily from the nearest to expiration standard monthly VIX Future to the next standard 30-day future such that the effective days until expiration of the combination stays right around 30 days. Before the introduction of the CBOE’s VIX WeeklysSM Futures this 30-day average was the best you could do with a volatility ETP that offered a consistent average time until expiration. Now, there are always futures available with at most 7 days until expiration, so theoretically an ETP could have an average time until expiration of 7 days. This theoretical ETP would have a beta of around 0.64 with respect to the VIX with compares to 0.45 for the 30-day average time till expiration of SVXY and XIV. Currently, the Weekly VIX futures don’t always have enough liquidity to support a passive ETP with a duration of 7 days, but the market is deep enough for the actively managed VMIN and VMAX to use Weekly VIX futures to achieve an average time till expiration of 20 days—delivering a beta of around 0.52. A 15% advantage doesn’t seem like a big deal, but with the sort of movement you get with the VIX it can make a significant difference. 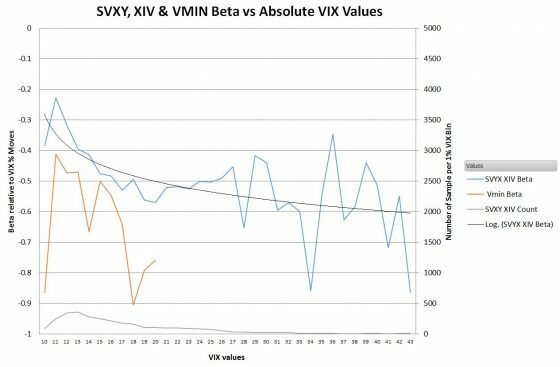 While the overall historic median beta of SVXY & XIV is 0.45, and VMIN’s is 0.52 it is interesting to look at how beta varies depending on the absolute value of the VIX. The chart below shows that relationship. This beta curve shows that VIX futures, and ultimately the volatility ETPs are less sensitive to VIX percentage moves when the absolute value of the VIX is at low levels (e.g., 10 to 13). I suspect this is because at lower VIX levels the gains due to contango drag become larger relative to the VIX related moves. For example, when the VIX is at 10 a 1% move is +-0.1 points and the futures’ percentage move would be around half of that. The daily contango gain at that point might be a consistent +0.1 points (and tends to increase at lower VIX levels), so the combination would significantly dampen the beta factor compared to higher VIX levels where a 1% move would entail a larger point move. For VIX values above 25 the amount of SVXY / XIV data starts getting pretty thin, hence the noisiness in the chart, but the beta values for lower VIX levels are pretty solid. The curve at the bottom of the chart (which uses the scale on the right) shows how many data points there are for each 1 point wide VIX bin. Since VMIN has been operating for a much shorter time we don’t have nearly as much beta data for it, but as expected it exhibits a higher beta than the 30-day average funds. Options are available for VMIN and VMAX. Currently, the bid/ask spreads for the options are quite wide and the volume / open interest is tiny, but I wouldn’t be surprised if the underlying liquidity is reasonable for limit orders close to the mid-point between the bid and ask. Along with their impressive upsides, inverse volatility funds like VMIN, XIV, and SVXY carry considerable risks. The risks include the inevitability of volatility spiking up during a correction or bear market. Since its inception in 2010, XIV has experienced three major drawdowns, one over 70% and two greater than 50%. 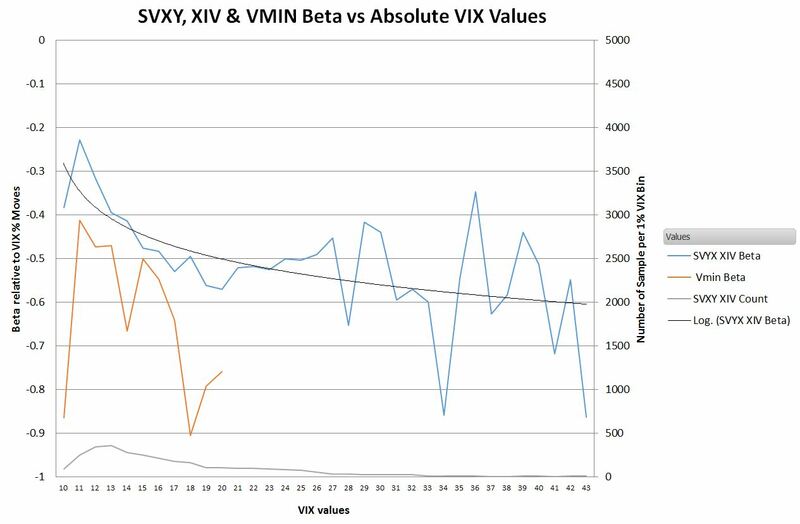 Because VMIN has a higher beta than XIV or SXVY it will likely suffer proportionally more. Buying and holding these securities is not for the faint of heart. Another risk is termination. If the VIX futures prices underlying these funds double intraday these funds will essentially be wiped out. You can’t lose more than your initial investment because they won’t go negative (unlike a true short position) but if things get bad enough these funds will receive margin calls on their short positions they can’t meet and the accounts will be liquidated. I’m guessing there may be somewhere between zero and 20% of the previous day’s assets remaining after such a scenario. VIX futures lag the VIX’s percentage moves in extreme situations but it’s not outrageous to imagine VIX futures jumping from a previous close of 14 to close at 28 given a bad enough financial or geopolitical event. Ironically, termination risk is higher when the market has been complacent. We are much more likely to see a daily 100% move in the VIX from 12 to 24 than a VIX jump from 24 to 48. We’ve never had a jump in VIX futures prices of the required magnitude, but it can happen, and probably will happen at some point. Be aware that multiple day volatility increases are not as destructive because these funds rebalance at the end of every day—effectively reducing their exposure. Three consecutive days of -35% would leave the fund down 73% overall, but the fund would never have been close to terminating. How Have VMIN and VMAX Performed? With an active fund you might expect the managers to try and time investments to boost each fund’s performance, but VMIN and VMAX don’t play that game—volatility moves are notoriously hard to predict—instead they are totally focused on delivering a consistently higher beta. 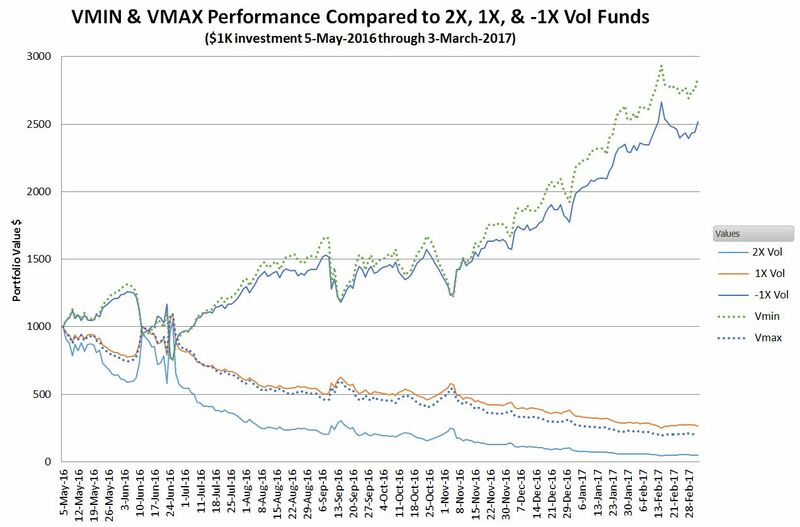 The chart below shows VMIN’s and VMAX’s performance relative to the existing 30 days till expiration volatility funds starting on their inception date of May 5th, 2016. VMIN’s performance over this period was exceptional, almost tripling in value, and not surprisingly VMAX suffered heavy losses. These new funds have demonstrated that they have created new performance choices. They offer higher beta’s and as a result, they will outperform the other 1X funds in favorable conditions (VXX, VIXY, VVVV, XIV, SVXY), while not decaying as badly as the 2X long offerings (TVIX, UVXY) during periods of high contango. VMIN’s exceptional performance since inception won’t continue forever. Eventually, volatility will spike up again and end the party, but VMIN has demonstrated that its innovative structure can deliver superior results in the right circumstances. What Caused the Volatility Tsunami on 5-Feb-2018? How Does ProShares’ SVXY Work?